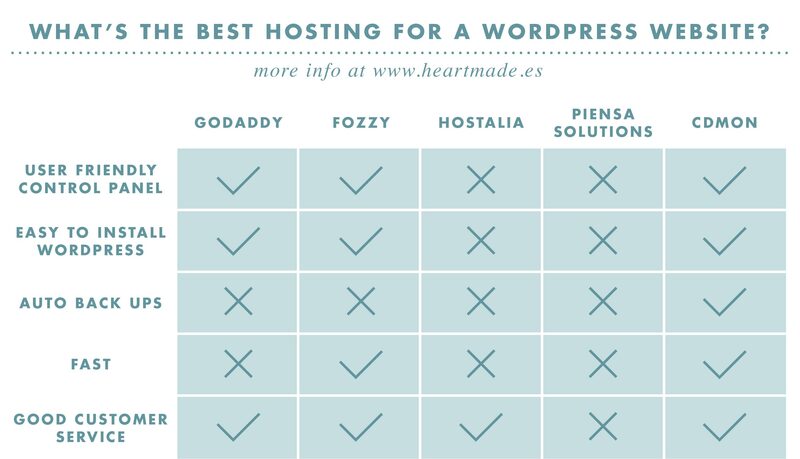 heartmade.es | What’s the best hosting for a new WordPress site? 29 Dec What’s the best hosting for a new WordPress site? 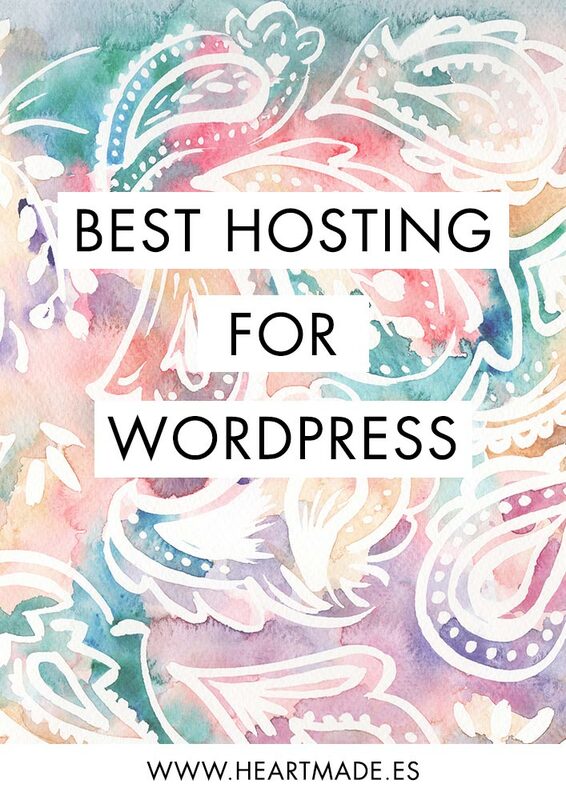 Here you have my opinion and review from my personal and professional experience to choose the best hosting provider for WordPress websites. Since many of my clients often ask me what hosting I would recommend, I thought it would be a great idea to write down my personal experience and give you my opinion and advice. I’m gonna start with the most popular, although I’ve only used it once. Many of my clients ask me about it and I’ve been reading online so many bad opinions that I never recommended it, but finally one of them decided to go for it and I could try by my own. I must say is not as bad as I expected. It has an easy button to install your WordPress site, but there’s a big con: it installs too many templates and plugins; so your website starts with so many things installed that it ends ups being a slow web. If you decide to choose them because, let’s face it, is one of the cheapest options on the market, keep that in mind and try to uninstall all the templates and plugins that you don’t need. I discovered it not long ago and I’m pretty happy with it. I even moved two of my websites there! They have many options and even if you don’t choose the WordPress Hosting you can always find a button on your control panel to install it. Their prices are pretty affordable and what I most like from them is the client service. They answer you super fast and they always provide you a solution. I have a 10% off code, so if you want to go with them just follow this link and use the code byheartmade. I think it’s mostly a Spanish hosting provider, but I ran into it few years ago and I started using it for many of my websites. Now I regret that decision. I will never recommend them again. They are tempting because they offer very low prices for 3 or 6 months, but then later the price is similar to the rest but the service is much lower in quality. Their control panel is not user friendly and you will need some expertise to install WordPress. There has been many times that I try to visit my websites and they are not available because they experience server problems. That can happen sometimes, at the end is made by humans and humans aren’t perfect, but in Hostalia this happens too much often. Moreover, their client service is not fast neither helpful sometimes. They offer phone calls but only on Spanish working time. It’s been years since I don’t even think about it, but the other day a client told me he had a hosting on it and I had to run to ask him to move it elsewhere. Piensasolutions is the first hosting provider I ever tried. I went for it because of its cheap price, but I ended soooo angry that I don’t even want to think about them. Their service is poor and when you have any kind of problem and try to contact them you can’t find a phone number, just an email service which they like to answer few days after with a copy and paste text from their own help center which, obviously, you have already previously checked and could not find your solution… So that’s my opinion: NO. Finally, CDMON is always my favorite. It’s a little bit more expensive than some of the others but it’s worth it. They offer a very user friendly administration panel to control all about your website. They have also a very easy install button for WordPress. Plus, they do back ups every day for your website. So in case you do some crazy stuff and loose all your data, you simply need to login to CDMON and get back to the day before with few simple clicks. Finally, their customer service is amazing. You can email them but they also have a phone number with someone attending calls 24 hours 7 days. Yes, ALWAYS! 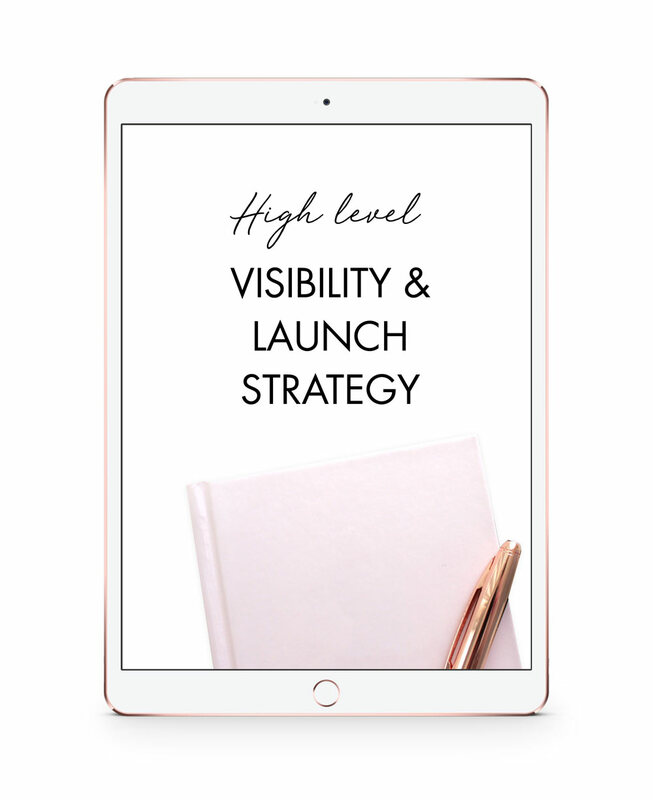 Hope it was helpful, let me know in the comments below if you have any other doubts so I can help you starting your new website!